Even the words business plan give me hives. But I’ve just read most of an amazing book, which I plan to review on Goodreads when I finish it, and Pamela Fagan Hutchins (What Kind of Loser Indie Publishes? and can I be one, too?) has convinced me that I need better organization to get on with indie publishing, which I believe in. So I have redone my project board. I use a piece of foam board, in which I punched two holes and added a ribbon (red because it’s important) and hung it on a wreath hanger on the door to the storage closet adjacent to my office space. I’ve been using stickies to remind me of the my projects, but this method did not keep me moving as well as I might have. So I stripped off those stickies and put up a big one for each of the next twelve months. 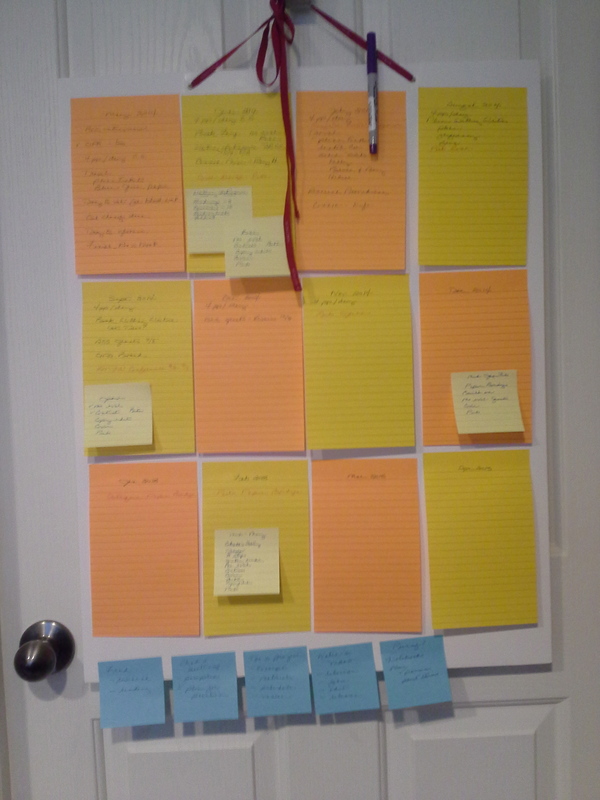 Smaller stickies remind me to anticipate three months in advance of when I hope–no, I plan–to publish the next book.The blue ones remind me that there are projects that don’t yet have a deadline or are ongoing. I took from Hutchins’ book permission to publish more than one book a year. I’ve got two novels “done” and a third in the works. That one in progress will get four hand-written pages a day in order to hit my goal of publishing it a year from now. Meanwhile, the other two will go public this year. And early next year I’ll publish a volume of poetry, new and selected. It’s time for that. With such a striking reminder in view every time I walk into my office, I have no excuse not to be more productive.